The shallow bowl created by the elegant metal leaf of this birdbath catches and holds up to two cups of rainwater. Made of powder-coated steel, it has a tripod base for stability in the garden or on a patio. 8-3/4" x 13-1/4" Holds 2 cups. Powder-coated steel Birdbath is 35" H overall Leaf is approx. This unusual birdbath features a dazzling, crackle-glass bowl that will delight the eye, with a wide rim that offers a perfect landing place for visiting birds. The bowl is supported by a graceful, twisted-steel stand. Bowl has the shallow depth songbirds prefer Stand has ground stake for stability Choice of Blue or Amethyst 12-1/2" in diameter x 36" H installed Protect from freezing Gardener's Supply Exclusive. 35" H installed 75-watt heater Holds 2 quarts Cord tucks away for birdbath use in summer months. Powder-coated steel, plastic Bowl is 13-1/2" in diameter x 2" H 37-1/2" H; approx. This plug-in steel birdbath has an efficient, 75-watt heater with a thermostatic control that heats only when necessary and keeps water from freezing at outdoor temperatures as low as -10??F. Birds need access to water in winter as much as in summer. In addition to drinking, birds use water for their frequent grooming, otherwise, their feathers can?? ?t insulate against winter?? ?s cold. The bowl is supported by a graceful twig-motif steel stand. The extra-wide, shallow basin will accommodate a whole flock of feathered bathers, and the wide rim offers a perfect landing place for visiting birds. Curly vines, perching birds and an aged-copper finish make this iron birdbath a natural for the garden. This sculptural piece is at home in any garden Bowl has the shallow depth songbirds prefer Stake has footed base for great stability Steel with a copper finish 6-quart capacity Footed base 24" W x 31" H.
A beautiful addition to any garden setting, the bowl of this glass birdbath has a shallow 2-inch depth that birds will find just right for bathing inches The cobalt blue and rich green glass is a colorful accent to your landscape. 35" H installed Protect from freezing temperatures Gardener's Supply Exclusive. Bowl fits securely into the metal stand Stand has footed stake for stability Holds 1 quart of water Attractive paired with the similar Butterfly Beacon Made of glass and steel Approx. You'll provide needed nourishment while you relax to the soothing sight and sound of water in motion, no wiring or installation needed. x 30"H. Stainless steel construction with real antique copper finish. Place our Stainless Steel Solar-Powered Fountain Birdbath with Copper Finish in a sunny spot, sit back and enjoy the show.  Solar-Powered Fountain Birdbath No wiring or installation necessary Built-in solar panel Includes gentle shower and bubbling fountain head Made of stainless steel Size 17-3/4" dia. Includes one gentle shower and one bubbling fountain head. The built-in solar panel circulates water whenever the sun shines. Local artisans employ old-fashioned hand techniques to produce pottery of the highest quality, craftsmanship and detail. Its clean lines and beautiful detail highlight the unique iron glaze, creating the look of a well-loved, time-worn accent. Our Telford Birdbath is a beautiful addition to your gardenscape and the perfect place for your favorite songbirds to bathe. Size17" dia. Each beautiful piece will make a lasting impression in your garden for years to come. Handcrafted with time-honored tradition in Roseville, Ohio, our Telford Collection will grace your landscape with its distinctive design. x 22"H Shipping Allow 1-2 weeks for delivery. Each beautiful piece will make a lasting impression in your garden for years to come.Mossy, hand-carved stone detailed with woodland flora gives our Fern Garden Birdbath a simple, earthy look. Local artisans employ old-fashioned hand techniques to produce pottery of the highest quality, craftsmanship and detail. Handcrafted with time-honored tradition in Roseville, Ohio, our Fern Garden Collection will grace your landscape with its distinctive design. 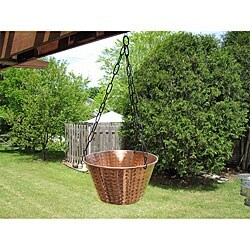 Its natural style and finish make it the perfect complement to your woodland or shade garden. x 22-1/2"H ShippingAllow 1-2 weeks for delivery. Fern Planter sold separately.Available ColorAged Moss Size17-1/2" dia. x 10"HBirdbath 17" dia. x 23-1/4"HShippingAllow 1-2 weeks for delivery. Part of the Wild Wings Collection, our Hummingbird Planter and Birdbath are artist-signed and dated. Local artisans employ old-fashioned hand techniques to produce pottery of the highest quality, craftsmanship and detail. Each beautiful piece will make a lasting impression in your garden for years to come. These pieces celebrate much beloved hummingbirds, depicting them and their native habitats in rich and detailed color.SizesPlanter 10" dia. Each artist showcases a unique style, so every hand-painted piece is a true original. Handcrafted with time-honored tradition in Roseville, Ohio, our Wild Wings Collection will grace your landscape with its distinctive design. Each beautiful piece will make a lasting impression in your garden for years to come.Part of the Wild Wings Collection, our Chickadee Planter and Birdbath are artist-signed and dated. Local artisans employ old-fashioned hand techniques to produce pottery of the highest quality, craftsmanship and detail. Handcrafted with time-honored tradition in Roseville, Ohio, our Wild Wings Collection will grace your landscape with its distinctive design. Each artist showcases a unique style, so every hand-painted piece is a true original. x 26"HBirdbath 17" dia. These pieces celebrate charming chickadees, depicting them and their native habitats in rich and detailed color.SizesPlanter 16" dia. x 21-3/4"HShippingAllow 1-2 weeks for delivery. Choose from a wide variety of colors for the perfect calming look for your home. The fountain measures 30.25W x 24H inches.. About the Platia FountainThe Platia Fountain constructed from cast stone is designed with three smooth tiers to provide a sense of harmony and peace for your garden or landscaping. About the Tulip Bird Bath FountainThe simply classic design of the Tulip Bird Bath Fountain makes this a wonderful addition to your front entrance or to your garden. The square stone finial provides a modern contrast to the otherwise circular fountain and a wide variety of finishes helps you to find the perfect look. Your feathered friends will enjoy your bakyard even more!. Smart Solar has offices in the U.S. What We Like About This Fountain Water gently trickles down the five-tier Mosaic Cascades Solar Fountain to inspire serenity and relaxation. This product carries a two-year warranty.Special Note: Solar Fountains and Bird Baths require direct sunlight to operate at full capacity. The panel can be wall-mounted stand-mounted or can stand alone with the included hardware for a variety of placement options. With such a wide range of solar-powered products Smart Solar uses an equally wide range of materials to make them including terra cotta ceramic copper slate glass aluminum resin and stainless steel. With an eye for fulfilling future consumer needs and a heart for preserving the environment Smart Solar is devoted to developing innovative high-quality and dependable solar-powered products.. Angle the solar panel each season to absorb maximum sunlight. A 15-foot cord attaches to the solar panel making it easy to position almost anywhere. Smart Solar offers products including solar pumps water features lights ventilators chargers and specialty garden items. and Germany and a manufacturing facility in Thailand. Please be sure to have a sunny spot ready for your fountain or bath.Click here for some frequently asked questions about Solar Bird Baths Bowl Dimensions:Bottom Bowl- 13.5 diameter x 5H inchesSmall Bowls- 6 diameter x 2.5H inches Please Note: Bowls are handmade so dimensions will vary slightly from one unit to anotherAbout Smart SolarDriven by a strong belief in the environmental benefits of solar power and the realization that consumers are becoming increasingly environmentally aware with an interest in buying solar-powered products Smart Solar was created in 2003. Based near Oxford in the U.K. A discreetly placed solar-powered pump draws water to the top vessel where it flows down from basin to basin until it reaches the bottom in a continuous recycling process.Maximize effectiveness by placing the 8 x 7-inch panel in full sunlight avoiding shade. What We Like About the Kyoto Bird BathBring an exotic feel to your garden with the charming Kyoto Bird Bath featuring a stylish short pedestal base. Choose from an array of natural finishes to dress up the outdoors.. A 12-inch rectangular bowl lets more than one bird take a dip in the water.